This archive item was inspired by a question from Fan Club member David Robinson. David asked if it was difficult to keep my hair looking immaculate in The Champions, and whether I had my own hairdresser on set or if I did it myself. 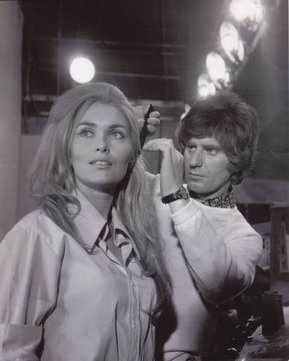 I did have my own hairdresser on set – a wonderful man called Mike Jones. You can see him giving the finishing touches to a "tousled mane" hairstyle in the picture. Mike was superb and we had a great professional relationship. The producers of The Champions insisted that I wore my hair up for most of the series as they said I looked too young to be a doctor – I was 20 at the time. It did mean a very early call each day. So to try and gain a few extra minutes of sleep each morning, I learnt to do my own make-up in 10 minutes flat. I still wanted Mike to look after my hair, though. Each day he would fill my head with metal hair pins – and at the end of the series I had a box of them which I swear literally weighed a ton!